– I finished this pillow for my friend Sarah. Now Martha’s pillow is safe from the threat of the pillow-napper. – I also finally finished these big brother gifts. 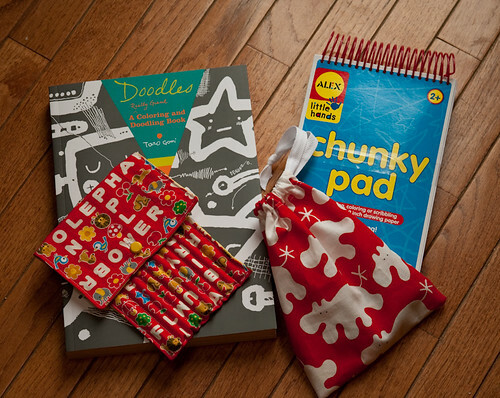 That pencil case drove me crazy. It’s pretty cute though so I’m getting over it. – I finished my last two squares of the Virtual Quilting Bee. There is more to say as this project wraps up so I’ll save that for another day. 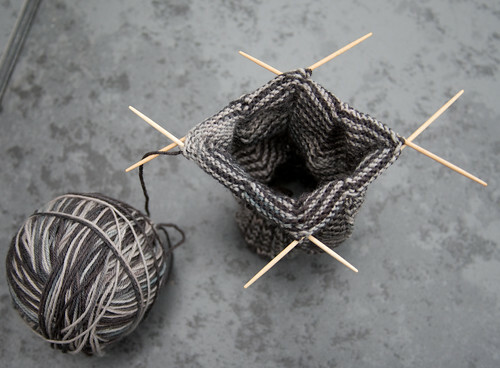 – I started a new pair of socks. The yarn — Lorna’s Laces Shepherd Sock Multi in Pinstripe– and the pattern — Jaywalker by Grumperina — were made for each other. 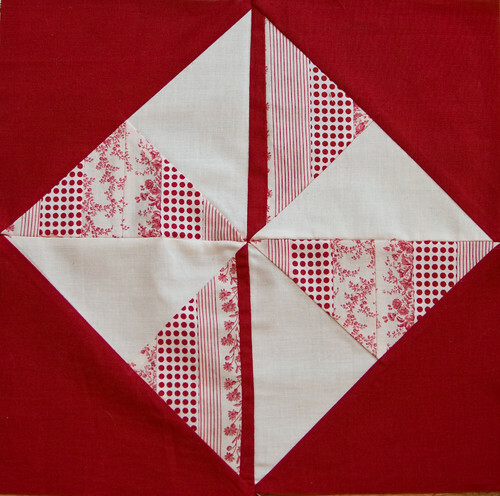 When Amanda Jean said she wanted a red and white quilt — only red and white — I thought, no problem. I have a ton of red fabric in my stash. Well, it turns out I didn’t have any of the right red and all the right reds had a little something else in them too — green, pink, tan. So I finally got myself to a fabric store last week and picked up a few red and white prints. I decided to make a star since Amanda Jean helped me begin to conquer my fear of triangles. I had to rip out the last seam about four times before I was satisfied with it. It is still not perfect but the points in the middle match so I’ll live with it. 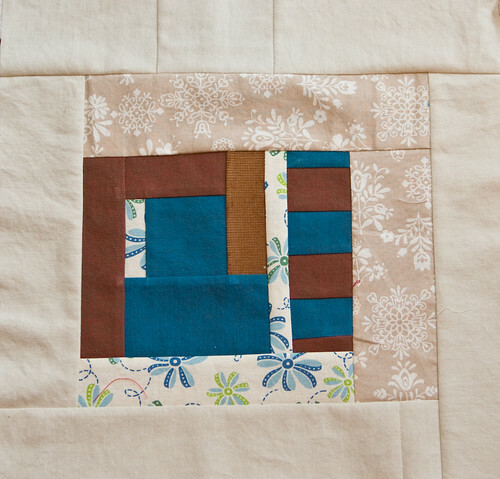 Courtney sent three solids and asked us to create a square that was bordered in the muslin color. Courtney said: feel free to tea dye, distress fabrics, or to pair them with things that appear just a little “off.” And if it’s a fabric that looks like it was your grandpa’s work shirt, or your grandma’s house dress even better. 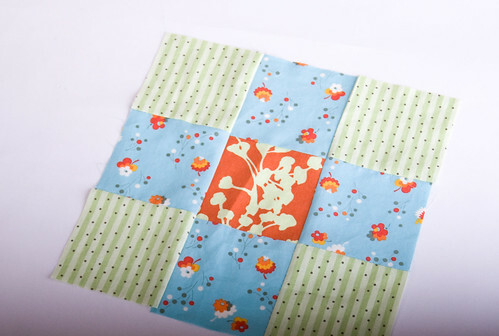 So I wanted my square to look like it was pieced together with little leftover or re-used scraps. I think I did it. Well, I hope I did. It’s hard to achieve. 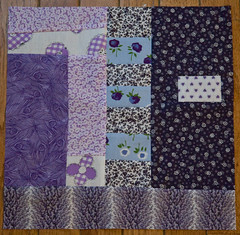 This is my block for Kathy‘s quilt — the March quilt of the Virtual Quilting Bee. 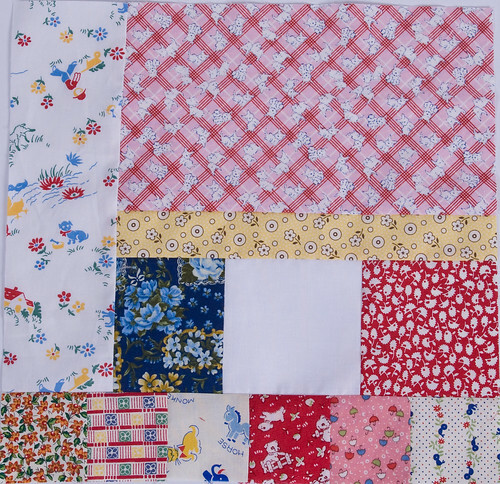 Kathy asked for the blocks to be log cabin in spirit and offered some Gee’s Bend quilt images and the quilts of Nancy Crow as inspiration. 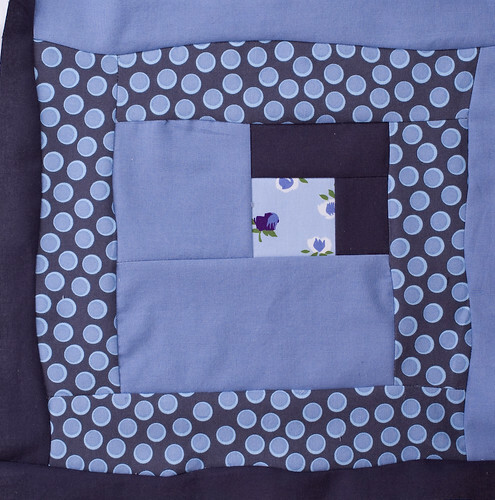 I knew I would have to use some solids and after seeing Anina’s block I knew I wanted to do wonky seams — coincidentally the tutorial for wonky seams is by Kathy. I really liked how the variation on strip sizes looked on this pillow top I made so I wanted to go with that design. My idea was for the seams to get wonkier as I progressed through the log cabin. The block ended up way too big so I had to cut it down. It’s hard to pre-cut for the wonkiness too. 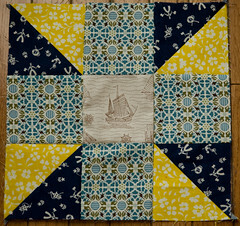 You can see more of how Kathy’s quilt is shaping up over in the flickr pool. Your sewing machine engines that is. 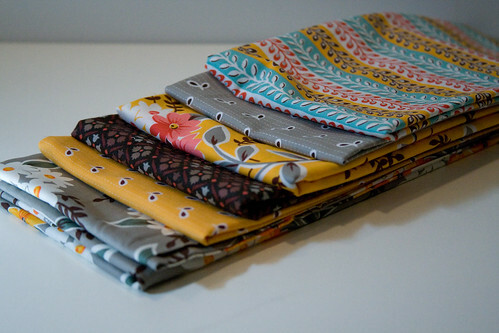 Today I cut twelve fat quarters and packed them up to send. 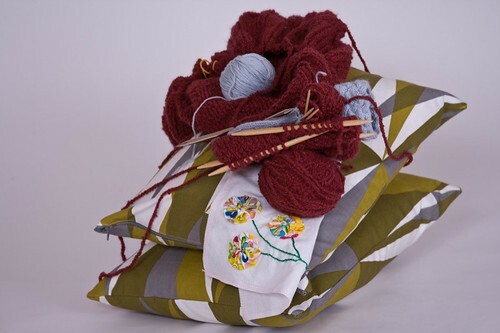 That can only mean one thing… the Virtual Quilting Bee is about to begin. My quilt is going to be first so I can be the guinea pig and work out any kinks in the system — as well as work out some participant nerves. So let’s talk about the quilt I’m hoping to have come March 1. 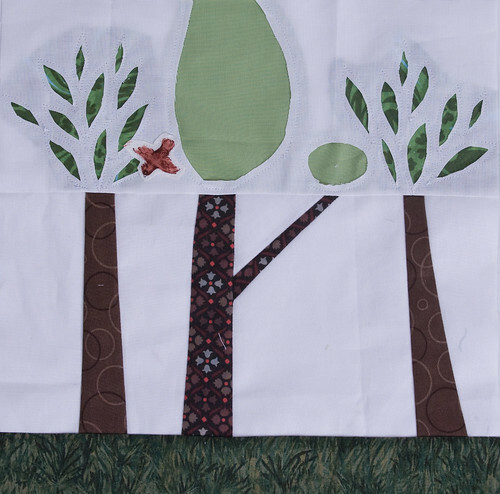 First off, the quilt is going to be for our playroom. This is where we spend a lot of time but the room is in our basement and it can be chilly down there in all seasons. 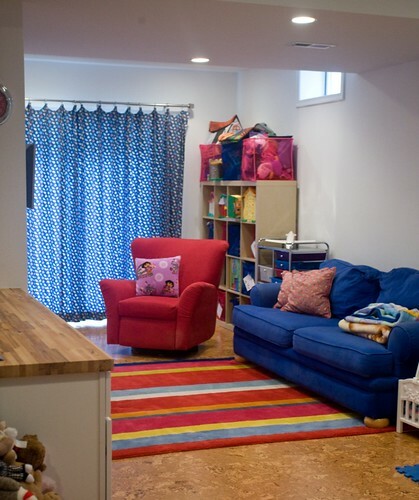 My crafty area is in this room too so happily I’ll be able to keep a close eye on the finished quilt. As you can see the colors are bright — really bright — and the mood is fun. I love the idea of all of you making a quilt to wrap around my kids. As for the actual quilt, I’m up for pretty much anything as long as it will tolerate the washing machine. 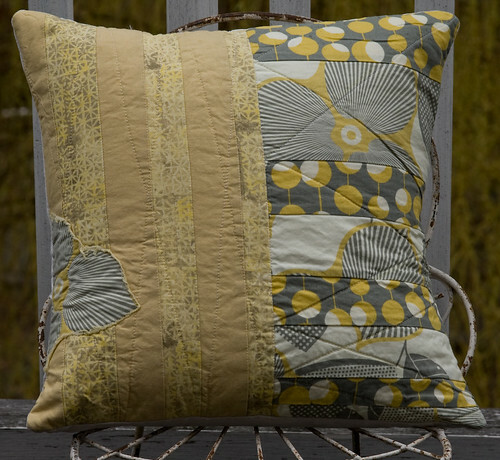 I love patchwork and appliqué; I think freezer paper stenciling is gorgeous; I don’t mind crazy patterns and textures. 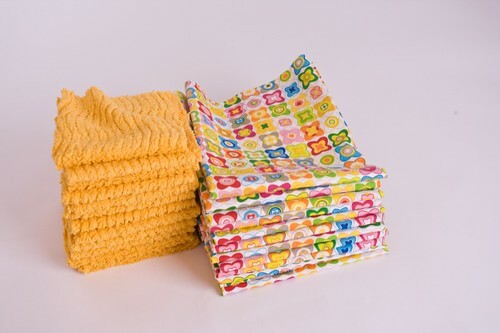 As for what I’m sending the group: the fat quarters are a busy, busy print from IKEA and I also included a 10″x10″ square of squash colored chenille. I’m planning to use the same chenille for the back. So, be inspired friends, I cannot wait to see what you come up with.